Rob Moore has penned a deal with Fareham. The former Great Britain international has agreed a switch to the National League conference west club from top-flight Surbiton. Moore, who has already been training with the Henry Cort Community College-based outfit, bring with him a wealth of experience. The former Havant player has 148 England caps and 91 for Great Britain, while also featuring for his country 11 times indoors. Moore, who was born in Winchester, also featured in the past three Olympic Games, including London 2012. 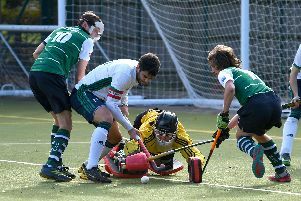 He said: ‘Fareham are the premier club in the region, much like Surbiton, with a strong reputation for being well-run, friendly and family-oriented – exactly the type of club I want to play for. ‘They are also very ambitious and have everything for me to both enjoy and be challenged on the pitch. Ben Barnes has admitted the arrival of his former international team-mate has been a huge boost to the club. Fareham’s performance director said: ‘To have someone like Rob join is a real boost to not only the first-team squad but to the club as a whole. ‘He is a world-class player with a huge amount of experience at the very peak of the game. ‘To be able to add his quality to the group after a successful season last year shows we are ambitious to keep improving. ‘His attacking style of play will fit in well with how we want to play. ‘I am sure we will play some exciting hockey this year. Meanwhile, Fareham chairman Colin Bradbury has thanked Moore for showing faith in the club. He said: ‘Rob is a great addition to the club. ‘He will help us continue in pursuit of our five-year plan to develop playing excellence on the pitch alongside an inclusive and family-friendly club that seeks to promote and develop young talent at all levels.